Spinner Wheels vs. In-Line Fixed – How to Choose? One major consideration when you’re looking for modern pieces of luggage are wheels that make the suitcase easy to move. Not all pieces have wheels but ones that do give you plenty to consider when you’re trying to figure out which offers the most portable and simple to use solution. For decades, suitcases with wheels have had at the very least, small wheels that look like they were taken off of roller blades. They were (and are) the same technology as in-line skates. They roll in one direction and are affixed to one side of the case. Two wheels mean the bag travels behind you with the weight resting on the back of the suitcase. The wheels make it easier to move, but you still have to manage some of the weight. 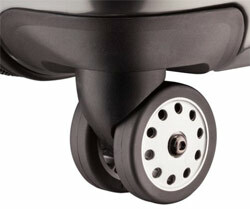 The newer breed of luggage includes at least four wheels that move in all directions rather than just back and forth. Called “spinners”, the sets can actually feature two wheels in each corner of the case (for a total of 8) to add additional stability. The coolest thing about spinner wheels is they don’t require much strength or control from you. Because of the four wheels, the suitcase is more likely to stand on its own even though it may require a small amount of stability from your hand. Some in-line models have an advantage with regards to stability, especially on sloped surfaces, but spinners don’t have to be tipped toward you in order to roll. They actually move standing straight up, and they can be maneuvered right beside you as you walk. Out of everything I’ve looked at, the question here is less about spinner wheels versus fixed wheels as much as it is about reliability. For instance, spinner wheels seem like the best answer because they require less work from you, but there are a lot of bag owners who complain about broken wheels. Spinners and high-quality spinners are two different things. The Samsonite Hyperspace Spinner offers a whole line of bags that use higher-quality spinners to keep all the bags in tip-top shape for a long time. The bags themselves tend to cost more, and they are not sold in a set, but they offer durability and wheels that aren’t likely to break. Meanwhile, options like the American Tourister Luggage Splash line I reviewed here (also sold individually and not in a set), use in-line skate wheels that can be considered an older model. They’re still rolling suitcases, but they put the pressure of the contents on your arm as you try to drag the suitcase behind you. The reports about the wheels on these are just as good as the Hyperspace Spinners though, and you’ll have a suitcase that works for airport travel regardless of the method used to roll it. On the other hand, the Olympia Luggage 8 Pocket Rolling Duffle offers a majorly roomy bag with many different options in size, but the wheels can be a major pain. They are the in-line skate style, and they’re actually very noisy. Beyond that, they are less reliable than some other options, and they have a tendency to get stuck or break. Spinning in Circles or Rolling One Way? Overall, I think I’m leaning toward spinner wheels for my next purchase because they are easier to maneuver and require me to absorb less weight from the bag. This is something I would appreciate as I’m whizzing through the airport or walking things up my sister’s long driveway. That being said however, I wouldn’t buy a bag just because it has spinner wheels as there are a lot of reports of wheels getting stuck on both kinds of cases. I guess this isn’t just down to the brand or particular design, but also how much abuse the bag goes through. At the end of the day, it’s best to think about how much maneuverability you need from a rolling case, as well as how often it’s going to be used.